grupetto, and we gladly donned them toward the end of class the other day. serious pose. Much more, soon. Wait, you ask our style?! this is what every class should be like. :) thanks for putting this up. The Blue Masks: Michael Aberman’s inspired tangent. oh, where are all the ladies——only one? This is great! We should consider wearing these every class and Dan should get a lower cut shirt. 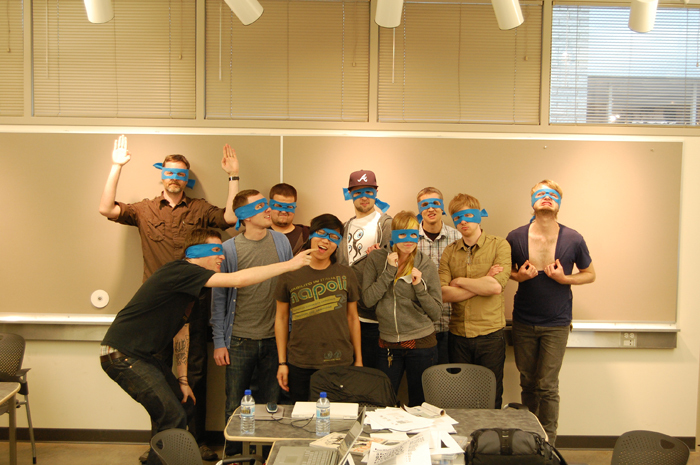 This entry was posted by Erik Brandt on Thursday, April 16th, 2009 at 8:51 AM	and is filed under Aktuell, Education, Free Radicals, Geotypografika, Globalization, Graphic Design, International, MCAD, Minneapolis, Musica Viva, Typografika, Typography, Unreasoned Love.